H.E Gov. Ibrahim Gaidam has presented the sum of N92,182, 336, 000.00 as the total amount of money to be spent by the State Government in the execution of projects and provision of services in the 2018 fiscal year. The governor made the presentation today on the floor of the State House of Assembly in Damaturu in a well-attended ceremony. “In keeping with our vision and mission as enunciated in Yobe the State Socio-Economic Reform Agenda, (YOSERA), in the 2018 budget estimates, we propose to spend the sum of N92,182,336,000. This figure represents an increase of N9,616,019,000 or 10.4% above that of the outgoing fiscal year”, the governor said. 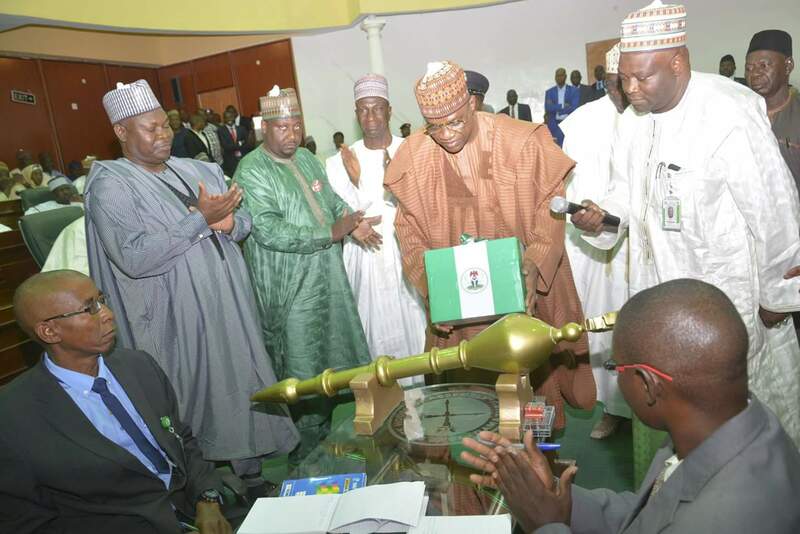 Tagging it the ‘Budget of Consolidation and Economic Rejuvenation’, H.E Gov. Gaidam explained that the 2018 budget will focus on completing ongoing ‘legacy’ projects and executing new ones to move the state forward. “In order to achieve our varied and far-reaching goals, we intend to spend the sum of N47,447,905,000 or 51.5% to cater for recurrent expenditure and the sum of N44,734,431,000 or 48.5% to cover capital expenditure. “From a holistic perspective, the 2018 Budget will enable us to complete all the ongoing legacy projects that our administration is bequeathing to our good people and take on new ones, in line with our overall developmental agenda”, he said. “Revitalizing the educational system to return to its former glory; increasing access to health facilities to the teeming populace through the accelerated upgrading of infrastructure, provision of basic requirements and human resource for health; promotion of agricultural activities as veritable tools for poverty alleviation, job creation, and food security, among others. “Taking further steps towards reducing the cost of conducting government business; provision and upgrade of infrastructural facilities like roads, water, and electricity supply towards reducing rural-urban migration and accelerating our Post-Insurgency Peace and Recovery efforts”. While reviewing the performance of the outgoing 2017 budget, the governor said the total revenues that accrued to the state from January 2017 to 30th November 2017 amounted to N67,489,142,111.06 which represent 82% of the target for the year. H.E Gov. Gaidam said the state made a lot of progress in the outgoing year, including in the areas of educational development, road construction, water supply, security, healthcare delivery services and the commencement of the construction an international cargo airport. On his part, Speaker of the State Assembly, Adamu Dala Dogo commended the governor for his leadership and commitment to moving the state forward. He assured that the Assembly will look expeditiously at the Bills that the governor presented. “Let me assure you that the 2018 budget consideration by the House will be more inclusive, participatory, transparent, accountable and speedy”, he said.